I have a fairly good grasp of many components but inductors baffle me. I try to read up on common mode and differential chokes, DC filter inductors and all kinds of different configurations but I don't understand the fundemental basics of them. I re-used the HUGE inductor/choke (which is it?) from the welder I modified to a power supply. I connected it between the rectifier and my capacitor bank assuming that it would help smoothing out the ripple in a LC filter configuration. Another thing I believe it helps with is some kind of "soft start" since the DC resistance of the winding should charge the capacitors a little more gentle or am I completely wrong? I may have a need for a three phase filter of some kind for "analog" SSR that controls a resistive heater load. I have looked at three phase filter chokes which are basically a toroid core with 3 separate windings, one after another, and also three phase inductors that seem to be much large and probably insanely expensive. What kind of interference can I expect from the proportional triggered SSR and what type of filter components should I try to find or make to reduce the noise on the grid? Am I right in assuming that the frequency of the noise is never higher than the driving frequency? A lot of components seem to be manufactured to filter out noise from SMPS but I need to filter mains frequency (50Hz). I am not an expert on inductors, so please someone correct me if the se simple terms are wrong. You can aim for a power factor of 1 by adding more capacitive or inductive reactance. A capacitor is a current source and a inductor is a voltage source. A inductor does not provide soft start like a resistor, as it need to build up its magnetic flux at start. I believe that L1 is what is referred to as a common mode choke but I am not sure of what it does. Common mode chokes that handle the currents I run are expensive so I omitted it. I did however find a beefy inductor that I installed as L2 but again I am not sure what it's main function is. For my current three phase project I was thinking about buying a big toroid core and wind 3 separate windings as big as can fit on it to make what I believe will be a three phase common mode choke. What kind of noise are generally created with triac dimmers? Is there a difference in function between a choke and a reactor? Magnetically I think the serve the same purpose but probably current rating and inductance (or is reactance?) probably differ. I have been having fights with these things too. But the ferrite core is used for DC and high frequency (choke), while the laminated iron ones are used for AC till 400hz (reactors) and I think iron powder cores too, which looks kinda like ferrite. This is not my area of expertise... I've always looked at chokes and inductors as two seperate electronic components. I believe the material used for a choke device is similar to an inductor but is very lossy. This allows the choke to absorb high frequencies but perform poorly when storing energy in a magnetic field which is what an inductor does well. To clarify the term reactance: reactance is a measure of the inductor's resistance to Alternating Current in addition to the DC resistance of the wire used to make the inductor. For example, when you send Direct Current through an inductor, the only thing that impedes the currents flow is the inductor's DC wire resistance. When you apply an Alternating Current to an inductor, in addition to the DC resistance, there is also AC resistance (reactance) which is dependent on the frequency of the AC. Now comes another term, impedance (Z), which is the combination of the DC resistance (R) and the reactance (X) and is written mathematically Z = R + jX. 'J' is the imaginary unit; it is an important part of the definition of real vs. imaginary current but off the top of my head I can't explain it. For normal math, I just say Z = R + X and then for ohms law it is V = I * X. I would be interested to hear others explanations on this topic and their critique of mine if they have any. So, as far as I know, you can't interchange an inductor with a choke but you can use an inductor with a capacitor as a low pass LC filter which can accomplish some of what a choke does. For the common mode choke I think you are stuck, has to be a choke. Thank you all for your input. It seems like for my low frequency applications I should search for laminated iron core or iron powder core. To better understand what kind of filter I may need for my dimmer I should probably hook up a single phase triac dimmer to a resistive load and connect my oscilloscope to get a better understanding of the specific noise I have to deal with. There seem to be powdered cores suitable for low frequency applications but the majority are mainly used in higher frequencies (above 10kHz). It also looks like these are not easy components to understand and they behave very differently when used in DC or AC applications. In the schematics for the Kemo dimmer I believe it's actually two different filters. The first consist of C1, L1 and C2 but I am not sure what the function of the second half of the filter is. From my speaker building days I would say the second half acts like 2nd order low pass filter. chokes serve as a high impendance for high frequencies, blocking EMI conducted by the wiring. A choke might also be a current limit device for a circuit with negative impendance. 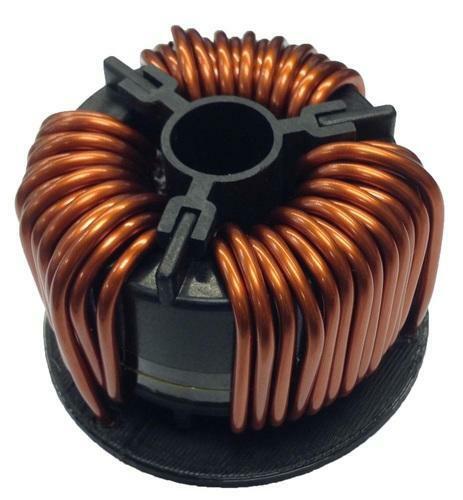 Reactors are low (50-400Hz) inductors service as inductive impendance , ie current limits . A more well known name are ballasts, or drossel for fluorscent lights. They can be used as passive PFC with capacitive loads, Mads has some info on his webpage. They act as current limiters in general, for starting motors etc. In general the many-turns-around-an-iron-core is not very efficient for reducing EMI , as there is a strong capacitevly coupling across the windings from output to input. When using a triac/dimmer/phase controlled switch with phase difference current/voltage a reactor is essential to prevent current blow out. SGS Thomson has a good application note about how to build a triac controlled power transformer. When controlling resistive loads with SSR the best option is to use on/off cycle controll with zero crossing detection, ie 50% load is 50% of the half cycles on. This gives the lowest EMI. The resistive load has typicall such high time constant compared to the AC frequency that you can control average power down to single % of maximum or even better. Single , differential or common mode chokes are just what kind of interference they will block. I prefer to use the distinction: inductor (single or coupled) versus transformer. The rule is this: a transformer is not intended to store energy; its inductance is maximal and its core is ungapped or only slightly gapped. An inductor stores energy, usually the full line or signal current. A CMC is a transformer. A 1:1 current transformer if you like, so that it tends to enforce equal and opposite currents on the lines. This has the effect of choking common mode AC currents. Note that a CMC doesn't make a very good transformer in the usual sense (as part of a forward converter, say), because the leakage inductance is pretty high by design. Ferrite beads: are transformers. One-winding transformer, doesn't sound very useful huh? Keep this in mind when selecting ferrite beads for filtering purposes. They saturate easily, so that, under bias, you don't get the impedance you were expecting. Even large ones (1812+ size, and THT beads) saturate at very modest currents (~200mA?). They are quite suitable for choking at low bias currents, like for peripheral DC supplies, logic signals and analog signals. Flyback transformers: are coupled inductors. The air-gapped core (or distributed gap) stores a predominant amount of signal energy. Mind, you still need good transformer characteristics, like low leakage and low capacitance (or, more generally, suitable characteristic impedance and bandwidth -- transformers are more generally transmission lines, so matched impedance and bandwidth factor in just the same). "Choke" and "reactor" are synonyms and may relate to one type or the other. I think "choke" refers mostly to blocking AC currents (just as a bypass cap shunts AC voltages), so I've used the term above in that way. A choke may or may not handle DC. A supply filtering choke does; a CMC does not. "Reactors" are generally for providing reactance (and therefore reactive power -- energy storage) at the mains frequency, so handle whatever signal current (and maybe DC) they're rated for. That was a pretty good explanation. Me like!